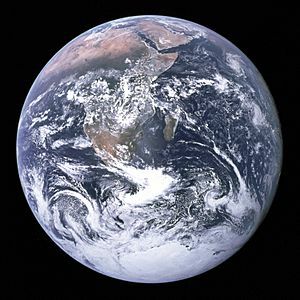 Earth seen from Apollo 17—the Antarctic ice sheet at the bottom of the photograph contains 61% of the fresh water, or 1.7% of the total water, on Earth. Fresh water (also 'freshwater' or 'fresh-water') is water that does not have a lot of salt in it. When people say 'fresh water', they usually mean water from the lakes, rivers, snow, and ice, which is not salty. It also can mean water that people can drink. The oceans and seas are made up of salt water, which people cannot drink. However, people cannot drink all fresh water, because it might be contaminated. It might have harmful bacteria in it, or poisonous because of chemicals it contains. 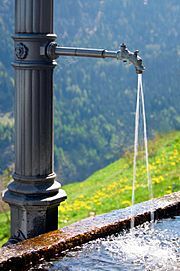 Water from a tap has been tested and treated so that it is safe to drink. This applies to most countries, but in some place the water needs to be boiled first to kill the germs and drunk after it has cooled down. Fresh water that people can drink safely is called 'potable water'. Desalination can turn salt water into drinkable water. Rivers, lakes, and marshlands, such as (from top) South America's Amazon River, Russia's Lake Baikal, and the Everglades in the United States, are types of freshwater systems. Fresh water habitats are divided into lentic systems, which are the stillwaters including ponds, lakes, swamps and mires; lotic, or running-water systems; and groundwater which flows in rocks and aquifers. There is, in addition, a zone which bridges between groundwater and lotic systems, which is the hyporheic zone, which underlies many larger rivers and can contain substantially more water than is seen in the open channel. It may also be in direct contact with the underlying underground water. The majority of fresh water on Earth is in ice caps. Water is a critical issue for the survival of all living organisms. Some can use salt water but many organisms including the great majority of higher plants and most mammals must have access to fresh water to live. Some terrestrial mammals, especially desert rodents appear to survive without drinking but they do generate water through the metabolism of cereal seeds and they also have mechanisms to conserve water to the maximum degree. Out of all the water on Earth, saline water in oceans, seas and saline groundwater make up about 97% of it. Only 2.5–2.75% is fresh water, including 1.75–2% frozen in glaciers, ice and snow, 0.5–0.75% as fresh groundwater and soil moisture, and less than 0.01% of it as surface water in lakes, swamps and rivers. Freshwater lakes contain about 87% of this fresh surface water, including 29% in the African Great Lakes, 22% in Lake Baikal in Russia, 21% in the North American Great Lakes, and 14% in other lakes. Swamps have most of the balance with only a small amount in rivers, most notably the Amazon River. The atmosphere contains 0.04% water. In areas with no fresh water on the ground surface, fresh water derived from precipitation may, because of its lower density, overlie saline ground water in lenses or layers. 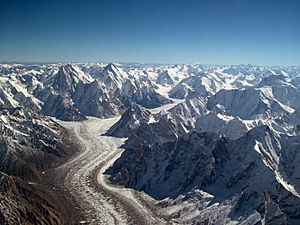 Most of the world's fresh water is frozen in ice sheets. Many areas suffer from lack of distribution of fresh water, such as deserts. An important concern for hydrological ecosystems is securing minimum streamflow, especially preserving and restoring instream water allocations. Fresh water is an important natural resource necessary for the survival of all ecosystems. The use of water by humans for activities such as irrigation and industrial applications can have adverse impacts on down-stream ecosystems. Chemical contamination of fresh water can also seriously damage eco-systems. Pollution from human activity, including oil spills and also presents a problem for freshwater resources. The largest petroleum spill that has ever occurred in fresh water was caused by a Royal Dutch Shell tank ship in Magdalena, Argentina, on 15 January 1999, polluting the environment, drinkable water, plants and animals. Changing landscape for the use of agriculture has a great effect on the flow of fresh water. Changes in landscape by the removal of trees and soils changes the flow of fresh water in the local environment and also affects the cycle of fresh water. As a result, more fresh water is stored in the soil which benefits agriculture. However, since agriculture is the human activity that consumes the most fresh water, this can put a severe strain on local freshwater resources resulting in the destruction of local ecosystems. In Australia, over-abstraction of fresh water for intensive irrigation activities has caused 33% of the land area to be at risk of salination. Fresh water is a renewable and variable, but finite natural resource. 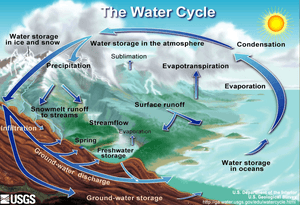 Fresh water can only be replenished through the process of the water cycle, in which water from seas, lakes, forests, land, rivers, and reservoirs evaporates, forms clouds, and returns as precipitation. Locally however, if more fresh water is consumed through human activities than is naturally restored, this may result in reduced fresh water availability from surface and underground sources and can cause serious damage to surrounding and associated environments. The increase in the world population and the increase in per capita water use puts increasing strains on the finite resources avialability of clean fresh water The World Bank adds that the response by freshwater ecosystems to a changing climate can be described in terms of three interrelated components: water quality, water quantity or volume, and water timing. A change in one often leads to shifts in the others as well. Water pollution and subsequent eutrophication also reduces the availability of fresh water. Many areas of the world are already experiencing stress on water availability. Due to the accelerated pace of population growth and an increase in the amount of water a single person uses, it is expected that this situation will continue to get worse. A shortage of water in the future would be detrimental to the human population as it would affect everything from sanitation, to overall health and the production of grain. Fresh water Facts for Kids. Kiddle Encyclopedia.